Nowadays, brand awareness is virtually invaluable. Companies are paying a premium for exposure in an era where competition is immense. If you are the head of marketing for a company, you will have profound insight into how challenging it can be to get your brand noticed in the digital age. You will also have an idea of how beneficial event sponsorship is. Not being sponsored, but instead, sponsoring an event, exhibition or trade show as a business. Just think about all the attendees live onsite you will essentially be advertising to. Not to forget new digital platforms which offer additional room to position your brand accordingly. What exactly is event sponsorship? Event sponsorship is the financial support of an event for the purpose of achieving business objectives such as increasing brand awareness or obtaining acknowledgement. It is one of the most organic ways to advertise. As you would have experienced, we consumers are bombarded with marketing from a multitude of brands every time we go through our mobile devices, and therefore, we have become frustrated by it. It’s intrusive and because of this, push-advertising has become much less effective, if impactful at all. 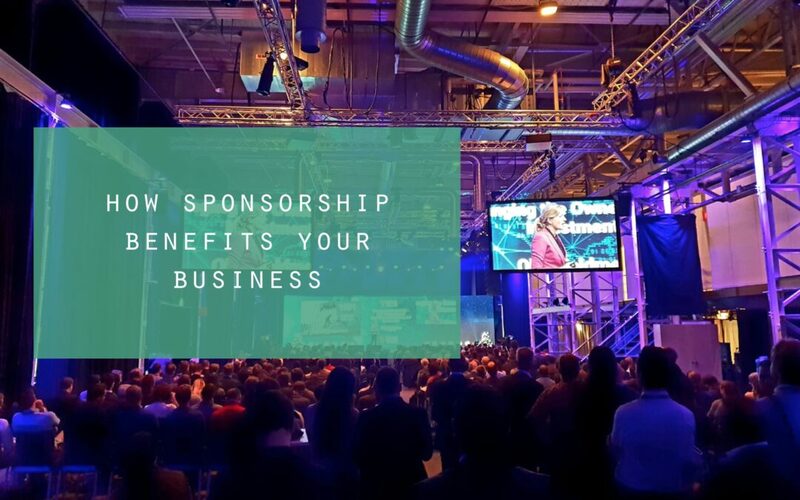 So, let us take a deeper look at how event sponsorship benefits your business and how you can use it to your advantage in more ways than one. Event organisers use a variety of platforms to promote their event which includes social media, their website, radio and television. When you sponsor an event, you are not just advertising to its attendees. You will also potentially be harnessing the rest of their following too. Your company’s name will more than likely be mentioned in all these situations which is incredibly beneficial for your credibility. As a business, by sponsoring an event, you immediately show authority and a sense of achievement, thus giving you credibility in your relevant industry and among your potential members. Attendees will see your brand throughout the event in a non-forceful way and are much more likely to come and find you and learn more this way. Not only will your company’s name be seen, but you may also be able to host a talk or a workshop at the event you sponsor as this can be negotiated as part of the deal. What better way to showcase what you are all about? The key is to find an event that is relative to your industry, thus showcasing your business to the right audience which leads us on to our next point. It is essential that you choose to sponsor an event that is relevant to your business because then you are more likely to have gain awareness from hundreds, if not thousands of people in your target market, who you can potentially build long-standing, mutually beneficial relationships with. It is one of the simplest and most organic ways of acquiring new customers. Sponsored events cater to niche audiences or member organizations and if you talk at one, you will be getting one on one face time with said audiences. This will also help with market share when up against your competitors. By sponsoring certain events, you may be able to reach customers somewhere that your competitor is not aware of yet, gaining the upper hand. Another benefit of sponsoring an event is that it has the potential to reposition your brand in the minds of your target audience. It can be incredibly impactful. By affiliating your company with certain brands, you can portray your business’s image in a different light. For instance, if your image is slightly dated, as in you feel that people may perceive your company has only relevant to an older generation, by collaborating with younger, more influential brands, you can change your image quite dramatically. Another factor is about more than money. By aligning your association with events that are actively involved in or causes or missions that your target audience is passionate about, you will be much more likely to create a stronger, instant connection with them. Today’s generation (Millennials, Generation Z) prefer a brand with a purpose, as in a brand with corporate social responsibility. It is imperative for brands to actively be involved in social causes and to back it up with sincere support in order to create a connection with this generation. Sponsoring events that are purpose-driven is the simplest way to achieve this. By realising how sponsorship benefits your business, you are one step closer to optimising your brand for the modern consumer, therefore making the likelihood new member acquisition even more possible. On the opposite side of the coin, associations can benefit greatly by having a business sponsor their annual events. Just as a business can benefit from sponsoring an event, associations that host such events can benefit substantially too. When it comes to funding your conference and organization’s event, who should you partner with? If you are looking for professional support, advice or planning solutions for event sponsorship, first read what our clients have to say, and then feel free to get in touch with us. Congrex Switzerland is an internationally operating agency delivering customised solutions. This encompasses the overall organisation of conferences and meetings including the management of hotel rooms and the strategic consultancy. Annually Congrex Switzerland organises approximately 45 events with over 73’000 delegates. Amongst our clients are international associations, governmental organisations and corporations. If you wish to receive additional information about Congrex Switzerland, please feel free to contact us. Want to be updated regularly?